<denyUrlSequences> - This element can contain a collection of URL sequence patterns that IIS 7 will deny; for example: you can deny parts of URL sequences that an attacker might try to exploit. 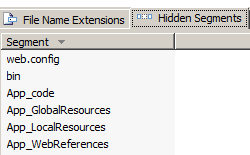 <fileExtensions> - This element can contain a collection of file name extensions that IIS 7 will either deny or allow; for example: you can block all requests for Web.config files. 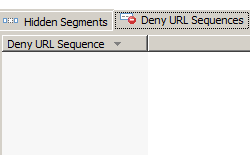 <hiddenSegments> - This element can contain a collection of URLs that cannot be browsed; for example: you can deny requests for the ASP.NET App_Code folder. 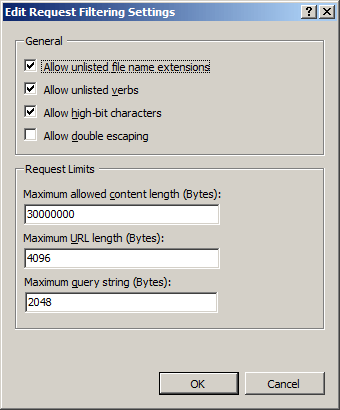 <requestLimits> - This element contains the settings for URL, content, and query string lengths. It can also contain a collection of user-defined maximum lengths for HTTP headers. <verbs> - This element can contain a collection of HTTP verbs that IIS 7 will either deny or allow; for example: you can block all HTTP TRACE requests. <alwaysAllowedUrls> - This element can contain a collection of URLs that request filtering will always allow. <alwaysAllowedQueryStrings> -This element can contain a collection query strings of that request filtering will always allow. <denyQueryStringSequences> - This element can contain a collection of query string sequences that request filtering will always deny. This allows administrators to block potentially dangerous query string sequences that they detect. 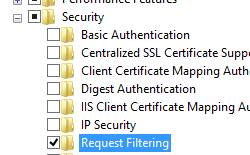 <filteringRules> - This element can contain a collection of custom request filtering rules. 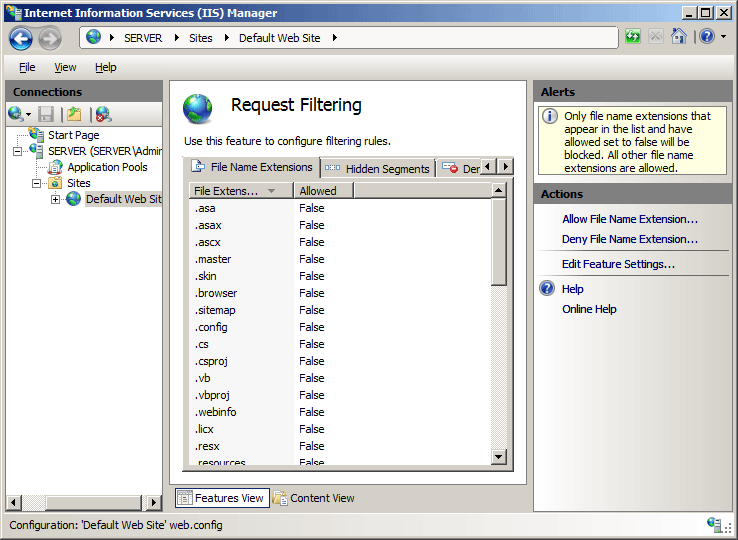 This collection allows administrators to create customized request filtering rules for specific criteria. 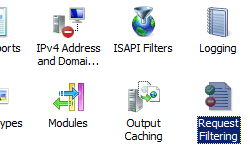 IIS 10.0 added the removeServerHeader attribute to suppress sending the HTTP server header to remote clients. These substatuses allow Web administrators to analyze their IIS logs and identify potential threats. 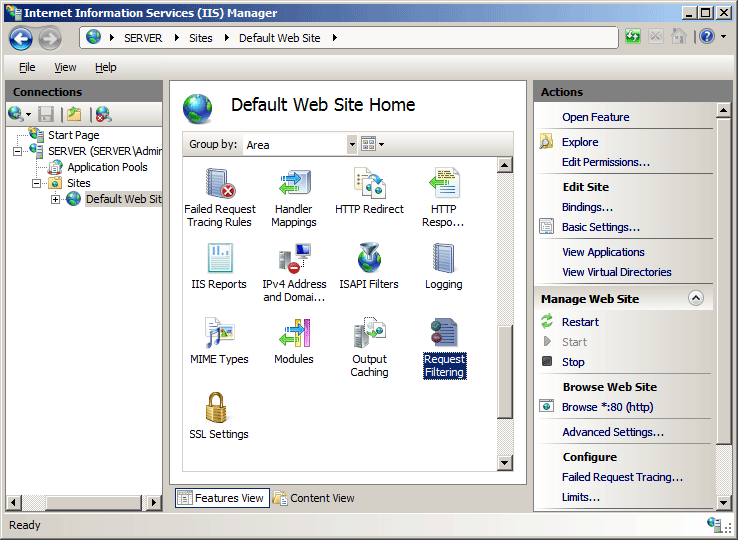 IIS 10.0 The ability to suppress the server header was added in IIS 10.0. 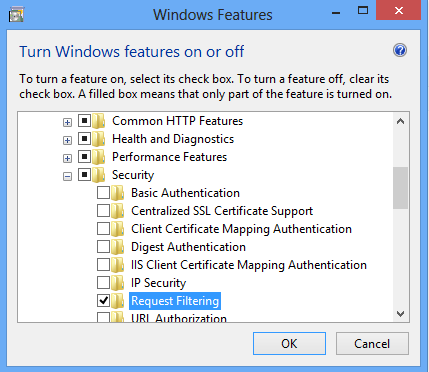 IIS 8.5 The <requestFiltering> element was not modified in IIS 8.5. 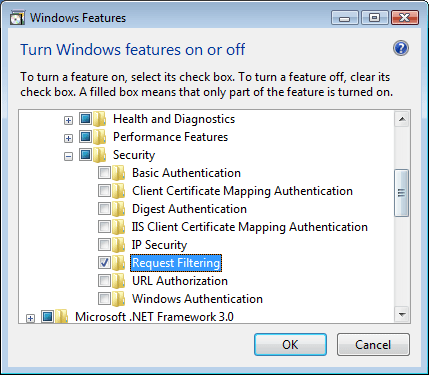 IIS 8.0 The <requestFiltering> element was not modified in IIS 8.0. 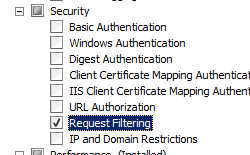 IIS 7.5 In IIS 7.5, request filtering ships with the unescapeQueryString attribute and the alwaysAllowedUrls, alwaysAllowedQueryStrings, denyQueryStringSequences, and filteringRules elements. These elements were first introduced as an update for IIS 7.0 that is available through Microsoft Knowledge Base Article 957508. IIS 7.0 The <requestFiltering> element was introduced in IIS 7.0. 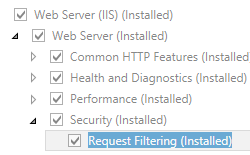 IIS 6.0 The <requestFiltering> element replaces the IIS 6.0 UrlScan features. Click Edit Feature Settings... in the Actions pane. Specify your options, and then click OK.
Change the maximum URL length to 2KB by specifying 2048. Change the maximum query string length to 1KB by specifying 1024. 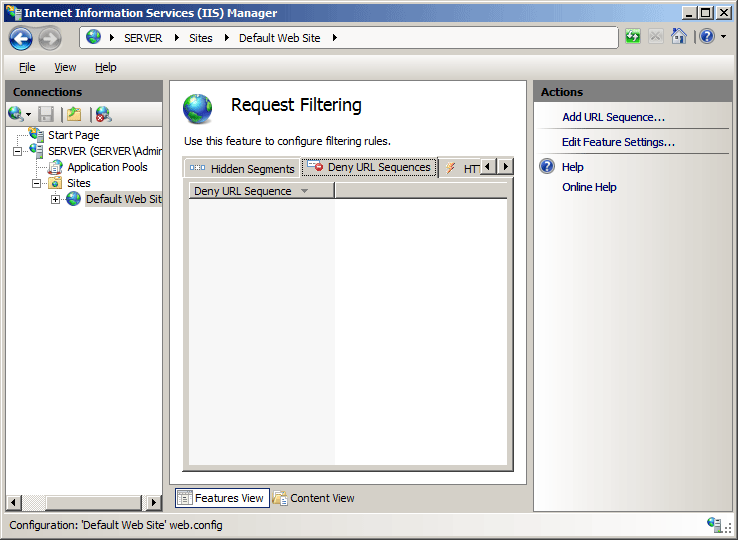 In the Request Filtering pane, click the Deny URL Sequences tab, and then click Add URL Sequence... in the Actions pane. 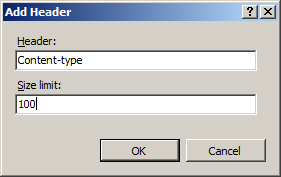 In the Add Deny Sequence dialog box, enter the URL sequence that you wish to block, and then click OK.
For example, to prevent directory transversal on your server, you would enter two periods ("..") in the dialog box. In the Request Filtering pane, click the File Name Extensions tab, and then click Deny File Name Extension... in the Actions pane. In the Deny File Name Extension dialog box, enter the file name extension that you wish to block, and then click OK.
For example, to prevent access to files with a file name extension of .inc, you would enter "inc" in the dialog box. 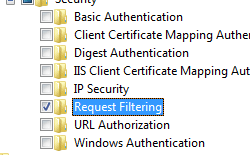 In the Request Filtering pane, click the Hidden Segments tab, and then click Add Hidden Segment... in the Actions pane. 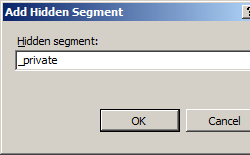 In the Add Hidden Segment dialog box, enter the relative path that you want to hide, and then click OK. 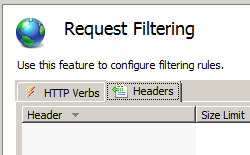 In the Request Filtering pane, click the HTTP verbs tab, and then click Deny Verb... in the Actions pane. 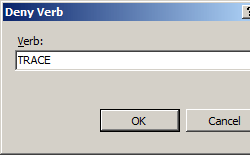 In the Deny Verb dialog box, enter the HTTP verb that you wish to block, and then click OK.
For example, to prevent HTTP TRACE requests to your server, you would enter "TRACE" in the dialog box. If set to true, request filtering will allow URLs with doubly-escaped characters. If set to false, request filtering will deny the request if characters that have been escaped twice are present in URLs. If set to true, request filtering will allow non-ASCII characters in URLs. 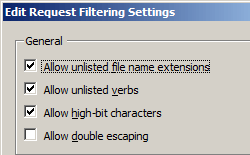 If set to false, request filtering will deny the request if high-bit characters are present in URLs. 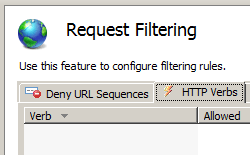 If set to true, request filtering will perform two passes on each query string scan. The first pass will scan the raw query string, and the second pass will scan the query string after IIS has decoded any escape sequences. 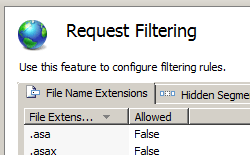 If set to false, request filtering will only look at the raw query string as sent by the client. 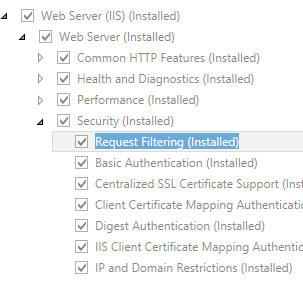 Specifies a collection of query strings that request filtering will always allow. 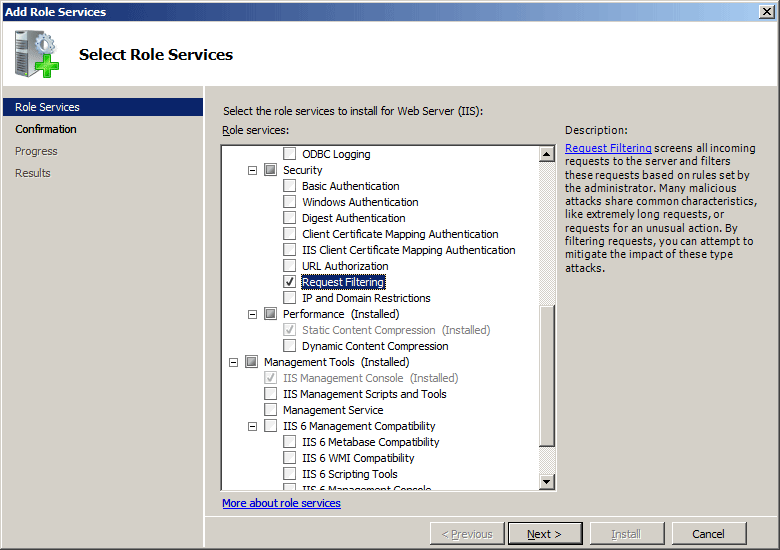 Note: This element was added in IIS 7.5. Specifies a collection of URLs that request filtering will always allow. Specifies a collection of query string sequences that request filtering will always deny. Specifies sequences that should be denied to help prevent URL-based attacks on the Web server. 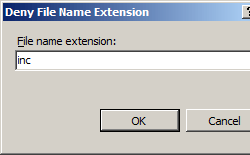 Specifies which file name extensions are allowed or denied to limit types of requests sent to the Web server. 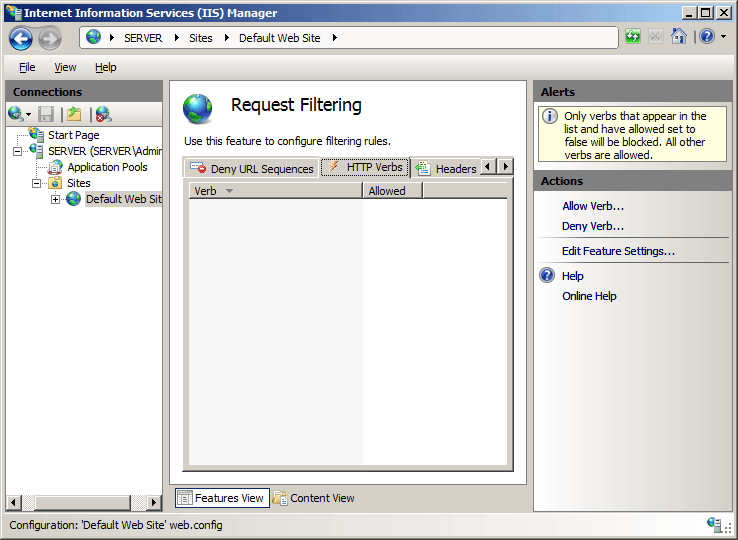 Specifies a collection of custom request filtering rules. Specifies that certain segments of URLs can be made inaccessible to clients. 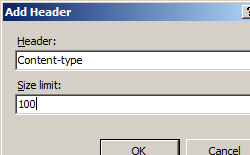 Specifies limits on requests processed by the Web server. 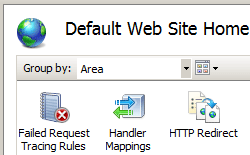 Specifies which HTTP verbs are allowed or denied to limit types of requests sent to the Web server. Denies access to two URL sequences. 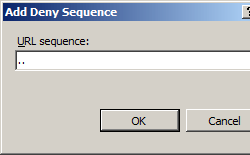 The first sequence prevents directory transversal and the second sequence prevents access to alternate data streams. Denies access to unlisted file name extensions and unlisted HTTP verbs. Sets the maximum length for a URL to 2KB and the maximum length for a query string to 1KB. The following code samples demonstrate how to deny access to three URL sequences for the Default Web Site: directory transversals (".."), alternate data streams (":"), and backslashes (""). appcmd.exe set config "Default Web Site" -section:system.webServer/security/requestFiltering /+"denyUrlSequences.[sequence='..']" appcmd.exe set config "Default Web Site" -section:system.webServer/security/requestFiltering /+"denyUrlSequences. [sequence=':']"
appcmd.exe set config "Default Web Site" -section:system.webServer/security/requestFiltering /+"denyUrlSequences. [sequence='\']"